The guys at BERG are just amazing. No wonder they came up with an amazing product. In his annual letter to shareholders, Amazon CEO Jeff Bezos explains why his company continues to re-invest in technology. Random forests, naïve Bayesian estimators, RESTful services, gossip protocols, eventual consistency, data sharding, anti-entropy, Byzantine quorum, erasure coding, vector clocks … walk into certain Amazon meetings, and you may momentarily think you’ve stumbled into a computer science lecture. Look inside a current textbook on software architecture, and you’ll find few patterns that we don’t apply at Amazon. We use high-performance transactions systems, complex rendering and object caching, workflow and queuing systems, business intelligence and data analytics, machine learning and pattern recognition, neural networks and probabilistic decision making, and a wide variety of other techniques. And while many of our systems are based on the latest in computer science research, this often hasn’t been sufficient: our architects and engineers have had to advance research in directions that no academic had yet taken. Many of the problems we face have no textbook solutions, and so we — happily — invent new approaches…Read full article. All the effort we put into technology might not matter that much if we kept technology off to the side in some sort of R&D department, but we don’t take that approach. Technology infuses all of our teams, all of our processes, our decision-making, and our approach to innovation in each of our businesses. It is deeply integrated into everything we do. Mirror, an interactive follow up to Sour’s Award-winning “Hibi No Niero, has been awarded gold for media innovation and non-broadcast media at the Art Directors Club global awards in New York. The music video for Japanese band Sour‘s “Mirror” track, best viewed in Chrome or Safari, pulls in video from users’ webcam, Twitter and Facebook accounts. The song ‘Utsushi Kagami’ (Mirror) sings about the fact that everything and everyone around you is a mirror that reflects yourself. You can find who you are in the reflection of others. (via InspirationRoom). Filming was produced by directors Masashi Kawamura, Qanta Shimizu andSaqoosha. $5227 was raised through 63 backers at Kickstarter. Those who pledged $30 or more received a promotional flyer signed by the members of SOUR, and a first look at the video prior to the release. $50 or more earned an mp3 of the new track ‘Mirror’. $100 or more earned the right to a name on the music video credit list under Special Thanks. $200 or more earned entry as special guest to the SOUR album release concert in Tokyo on December 19. $500 or more was recognised with a special SOUR T shirt & Eco bag. $1000 or more earned free video concept work from Masashi Kawamura. Thanks Alex Trimpe for putting this video together. Brilliant work and a helpful source in terms of Facebook stats. Companies will continue to stress return on investment and the real value of the customer voice. An experiment of UCLA professor Gary Small showed that web surfers brain activity is far more extensive. Particular in areas of the prefrontal cortex associated with problem solving and decision-making. When we go online we enter an environment that promotes cursory reading, distract thinking and superficial learning. 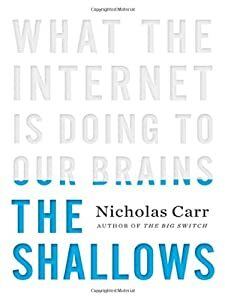 The Internet is turning us into shallower thinkers and changing the structure of our brain. In the 1980’s people thought the introduction of hyperlinks would strenghten critical thinking, enable us to switch easily between different viewpoints – a technology of liberation. But because it disrupts concentration it weakens comprehension. A study from 1989 showed that readers tended just to click around and could not remember what they had and had not read. People, who read linear text comprehend more, remember more, and learn more than those who read hyperlinked text. It took the hypertext readers longer to read the document and found it confusing. Whenever a link appears, your brain has at least make the choice not to click, which is itself distracting. And more recent research suggests that links surrounded by images, videos, and advertisements could be even worse. In a study text-only viewers answered significantly more questions correctly. They found the presentation more interesting, more educational, more understandable, and more enjoyable. It’s single-minded and we can transfer information into our long-term memory that is essential to the creation of knowledge and wisdom. While reading the information is flowing into our working memory. When the load exceeds, we are unable to retain the information or to draw connections with other memories. We can’t translate the new material into conceptual knowledge. Numerous studies show that we read faster as we go online. Problem is that many different kinds of media coming at us simultaneously. Office workers often glance at their inbox 30 to 40 times an hour. And every time we shift our attention, the brain has to reorient itself. Increasing the likelihood that we’ll overlook or misinterpret important information. But we want to be interrupted. Each interruption brings us a valuable piece of information. The neverending stream of new information also plays to our natural tendency to overemphasize the immediate. we crave the new even when we know it’s trivial. We accept the loss of concentration, focus, and fragmentation of our attention. We rarely stop to think that it might actually make more sense just to tune it all out. Web browsing strengthens brain functions related to fast-paced problem-solving, particular when it requires spotting patterns in a welter of data. But it would be a serious mistake to conclude the Web is making us smarter. The problem is that skimming is becoming our dominant mode of thought. In a metaphorical sense, we are evolving from cultivators of personal knowledge into hunters and gatherers in the electronic data forest. We seem fated to sacrifice much of what makes our minds so interesting. 1) That’s what I like about the iPad. You are focused on one thing. There is no multitasking. That seems to me is a benefit and big advantage. It forces you to stick to one task. 2) Do not stop reading books! 3) Blogs and tweets repeat the same knowledge. Makes sense, so we have more chances to take the information in. 4) What is with people who will grow up just reading online sources and don’t know text without hyperlinks at all? 6) Everyone has the choice, that skimming is not your dominant mode of thought. Flipboard – best new app for my iPad.